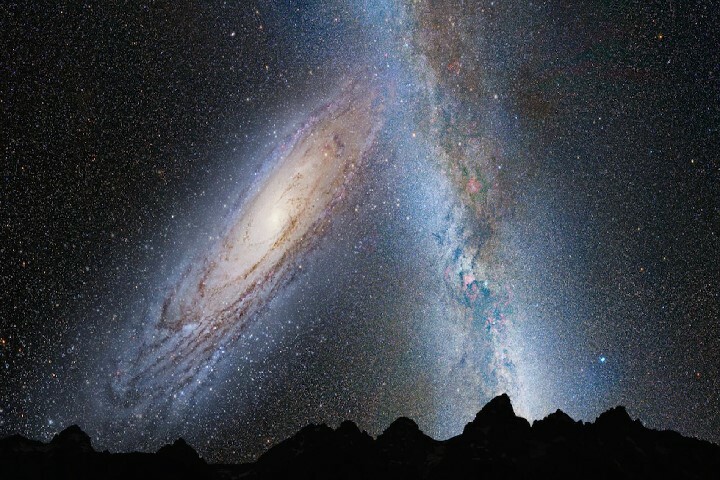 Scientists knew that our galaxy Milky Way and Neighbour Andromeda galaxy were going to collide together and that would be a spectacular show. But scientists were unaware of the information about the time when the galaxies are going to crash. Now, the scientists have figured out the time when the two galaxies would collide and make a new formation of the stars and the planets. Group of astronomers conducted research and calculated the time of the collision. Previously, it was expected to be 3.9 billion years from today. But as per the study, it is 4.5 billion years from now. Astronomers used ESA’s Gaia telescope to understand and observe the movement of the stars in both of the galaxies. As per their calculations, the time should be 4.5 billion years from now. We don’t know if humanity will survive till the collision, but even if would, then it might not survive the crash of two galaxies. Also, astronomers claimed that the collision would be side-swept and there will be less devastation than what we’ve expected previously. As the distance between two astronomical objects is vast in cosmos, our galaxy, which is nearly 70,000 thousand light years away from the center of Milky Way will remain untouched. Before colliding with the Andromeda, the galaxy has to pass through Large Magnetic cloud, and that event will happen in 2.5 billion years. The large magnetic cloud will affect the solar system and other ecosystems in the galaxy and might destroy humanity. But also, it will increase the mass of the black hole that is in the center of our galaxy, and that’ll help us maintain the spiral shape even after a collision with Andromeda.